Today the international community faces shifting global markets as well as a need to balance remedies to macro-economic challenges with the urgent call for a meaningful response to climate change. In this complex environment, international standards are powerful tools to lead positive change by detailing specifications that can open up global markets, create enabling business environments, spur economic growth and help mitigate and adapt to climate change. International standards represent the consensus view of the worldís leading experts in industry sectors ranging from energy utilities and energy efficiency to transportation, management systems, climate change, healthcare, safety and information and communication technology (ICT). Volunteering their knowledge in service of the public interest, experts in these and many other subjects come together to create standards that share innovation with all the worldís countries and so provide business, government and society with a solid platform for positive change. Standards support rapid economic growth in developing countries by outlining best practices that enable them to avoid ìreinventing the wheelî. Given the strong correlation between economic growth and urbanization, standards are becoming increasingly important in helping cities develop more intelligent and sustainable infrastructures, making them better places to live. International standards are ensuring that products, services and environments become more accessible to persons with disabilities. Standards are also applied as tools to help reduce climate change by improving energy efficiency and decreasing waste and greenhouse gas emissions. Standards share best practices in renewable energy generation, provide cutting-edge requirements and processes for waste disposal and recycling, and tools to enhance efficiency and environmental sustainability across all industry sectors. International standards bodies such as IEC, ISO, and ITU provide cohesion to a myriad of national and regional standards; thereby harmonizing global best practices, eliminating technical barriers to trade, and fostering shared socio-economic advance. These benefits are ultimately all passed on to the consumer in the form of greater choice, increased quality and lower prices. Today, IEC, ISO and ITU are employing the time-tested benefits of standardization to broker global consensus on the best approaches to contemporary social, economic and environmental challenges. 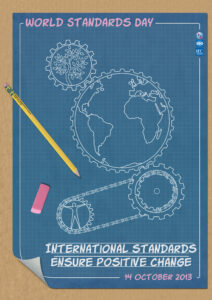 The principles underlying international standardization are today more relevant than ever. Standards continue to ensure positive change by removing barriers to communication and cooperation, and the work of IEC, ISO and ITU remains central to the development of standards that share knowledge among all the worldís countries and so provide building blocks for global prosperity.